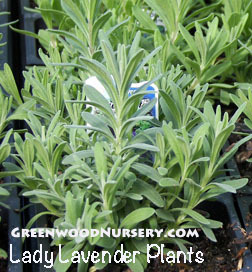 Lady Lavender plants are one of the most fragrant of Lavender plant varieties. Lavandula angustifolia 'Lady' is a compact growing English Lavender that matures in the 12 to 18 inch height range. Use Lady Lavender as a garden border,low hedges and is perfect for small gardens. Plants shipping to CA and AZ addresses may be bare rooted before being prepped for shipping.